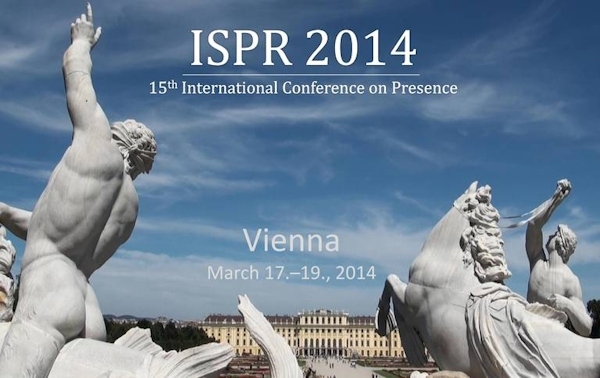 [The August 30 deadline for submitting work for our next exciting and fulfilling conference adventure, ISPR 2014 in Vienna next March, is near. For the latest information see the conference web site and Facebook group. Following a series of 14 successful PRESENCE conferences, ISPR 2014: The 15th International Conference on Presence will retain the single-track format and pleasant social environment of previous conferences while featuring expanded oral presentations, poster presentations, panels, keynote presentations and hands-on demonstrations of presence applications, services and projects. Presence is commonly referred to as a sense of “being there” in a technologically mediated environment and more formally as the perceptual illusion of non-mediation. In other words, the user of an artificial environment fails to accurately and completely acknowledge the role of technology in his/her experience and thus, feels and behaves in this environment as if it was ‘real’: for instance, we feel and act as if we’re actually with colleagues, friends and family when we use an increasing variety of conferencing technologies; we treat computer generated virtual agents as if they are sentient social entities even though we know they are not; we feel afraid of a virtual spider crawling over our hand or of an abyss opening up beneath us even though we are in fact aware that neither the spider nor the abyss exist; we like to be thrilled and deceived by 3D IMAX films which make us feel as if we are flying over the Grand Canyon or through outer space; and we ‘get lost’ in TV-shows, movies and videogames. The vast benefits and implications of the Presence experience for various areas of life are still to be revealed. To date, the advantages of this ‘as-if’ experience are broadly used in education and training: doctors learn how to operate on difficult injuries using simulators, students visit virtual classrooms, pilots train their reactions to critical situations via virtual reality, and post traumatic stress disorder patients learn to deal with their traumatic experience by being confronted step by step to the traumatic event, which to them – even though it is virtual – feels real. Presence is a rich, fascinating subject of scientific investigation, artistic exploration and technological development and design, with increasingly important implications for the ways in which people work, play and live. Today, Presence phenomena are the subject of research and theory in communication, computer science, psychology, business, philosophy as well as many other scientific and humanities fields; and they are a great challenge for designers and developers, who are trying to refine technology in order to create the most compelling and convincing –the ‘optimal’ – Presence experience. All accepted papers will be collected in the official conference proceedings (with ISBN) and will be permanently available for download in the ISPR conference archive. ISPR 2014 will have an interactive single-track format in which all participants (attendees, presenters, speakers, keynote speakers) attend each of the sessions as well as social events, allowing participants to exchange ideas and build knowledge together as the conference progresses. The first two days will feature oral presentations, panels and keynote presentations on a variety of topics designed to provide focused educational experiences on subjects related to presence technology, theory and measurement. Additionally, a poster session will allow insights into ongoing presence related projects. The final day of the conference will feature additional academic presentations as well as hands on presentations of presence applications and technologies. The language of the conference is English. The conference will be held at the University of Vienna in Austria (www.univie.ac.at). Founded in 1365 it is the oldest university in the German-speaking world and with approximately 91000 students one of the largest in Central Europe. As the capital and largest city in Austria Vienna is regarded as the City of Music because of its musical legacy. It is furthermore known for being the home of Sigmund Freund, the founder of psychoanalysis. The city is rich in architectural ensembles, including Baroque buildings, castles and gardens as well as Romanesque churches and art nouveau structures and offers a great opportunity to dive into the cultural richness of European art and music. A number of hotels with specially discounted rates for conference attendees will be available. Registration will be available online soon. The fees are listed on the conference web site (http://presence2014.univie.ac.at) under “Registration.” Every effort has been made to reduce fees for participating academics, and particularly for students. We invite researchers and practitioners to submit their work in the categories below. Note that all submissions are to be in APA format and (with the exception of panel proposals) not identify the author(s) directly or indirectly (for blind peer review). POSTERS: Visual display presentations. Poster proposals must describe and/or contain early drafts of the visual display. Accepted poster abstracts will be published in the conference Proceedings. Posters shall be in a DIN A0 (84.1 x 118.9 cm) format as they will be displayed on a board during a dedicated session of the conference. Each poster will be allocated a 2 minute oral preview. All submissions are to be made through the EasyChair conference online submission system (a corresponding link will be available on the conference web site: http://presence2014.univie.ac.at). Each submission will undergo a double-blind peer-review process by at least two selected reviewers. The Program Committee members are prominent members of ISPR. The International Society for Presence Research (ISPR) is a non-profit membership organization founded in 2002 to support academic research related to the concept of (tele)presence. It publishes ISPR Presence News, which features news stories about presence; calls for participation in various presence-related conferences, publications and projects; job opportunities; and more, and is available in various formats (RSS feed; individual item and daily or weekly digest email; Twitter; Facebook). The ISPR web site – http://ispr.info – serves as a resource for those who conduct research, develop theory, design, market, write about, or simply are interested in, the concept and phenomena of presence.